We were all young once. 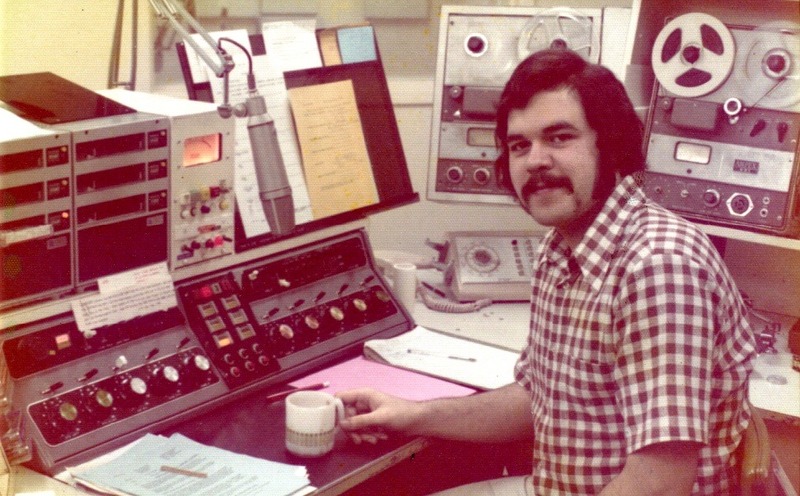 Here I am in the main radio broadcast studio at CJOB during the early 1970’s. When you look at your picture album, do you ever notice that while you look so young, everything around you in the photo looks so old? Young broadcasters might have difficulty identifying these historical artifacts. Today’s broadcast studios are mostly software and monitors. Back in the day, we had hardware, and lots of it! CJOB was Winnipeg’s dominant radio station for most of the late 20th Century. I was fortunate to work there during these really golden years. At one point, CJOB had the highest adult market share of any radio station in North America. There are probably only two things in this picture that are still found in a radio studio. The first is the classic Neumann U87 condenser microphone, which has been around since the late 1960’s. The second is the suspension boom scissor arm holding the U87. Each announcer relies on this arm to fastidiously arrange the microphone “in the right place”. Arguably a third surviving artifact from this picture is the chair. But modern chairs have improved substantially. In the old days, I remember actually changing chairs several times during a six-hour shift in a futile effort to get more comfortable. Now, for the relics (excluding me)! Turntables, center right behind my shoulder you can see a tone arm. This studio had three McCurdy CH12 turntables for playing records. Each had a big silver knob for setting the speed and disengaging motor drive from the turntable. This was important when you needed to cue the record to the beginning of the song. All the music for each show was stacked up to the left rear of the announcer – both albums and 45’s. Back then, announcers could pick their own music, but did have to follow a format of various genres. Tunes that we could play were marked with an “X”. The rest were off limits, although I must admit straying once in while. Tape recorders, top right. This studio had two Ampex 601 recorders. These were 26 pound “portable” units, which we used mainly to play back recorded features on 5” reels of audio tape. They were also used for announcer “air checks” and could be set to automatically start/stop recording when the microphone was engaged. Analog Telephone, center. We relied heavily on a highly modified Western Electric Call Director for on-air calls (including screening open line show callers). During the evening and overnight, the announcer was also the receptionist. Finding time to answer the phone was challenging but useful for receiving listener feedback and news tips, in the absence of Twitter. There was also a direct private line for use by managers and engineers (and occasionally, the number leaked to wives and girlfriends); when it rang, the red light in the center console would flash. I recall that it sometimes rang when I played a record not marked with an “X”. Spot Machines, center left. A pair of ITC-3D cart players was used to play 30 and 60 second commercials, and jingles. “Carts” were continuous loops of tape in a plastic cartridge (Fidelipac “A”). Cart machines relied on sub-audible tones being recorded at important places, especially at beginning of the next item to stop the cartridge ready for its next use. Our engineer also modified these machines to place tones at the end of the commercial, to mute the audio from the machine, as the tapes often contained noise. Studio Console, lower left. We used a heavily modified Gates Radio Console, monophonic of course. The mods included placing start buttons for the six cart players, and for the three turntables, in the center of the console, with the VU-Meter removed and placed at eye level. The switches and pots (volume controls) in these consoles seemed to last forever and survive the occasional coffee spill (for which the engineer educated the announcer about the meaning of “wrath”). Paper, on the counter surface and at eye level. Did you ever wonder how the announcers at CJOB knew so much about community events? That pink stack of paper in the middle of the counter is an internal document called “CJOB Knows”. Updated weekly, it listed virtually all the important community activities in the region, from sports events to community festivals. On the right is the program log, which listed all of the things that had to happen minute-by-minute: commercials with ID numbers, weather reports, and so on. That tall white sheet behind the microphone is the weather report – including the forecast and current readings in various locations. The guys in the newsroom (they were all guys back then) were supposed to update the weather for you regularly. And some actually did. One final comment. Broadcast engineers in the old days had to do many modifications and interconnections to make all the hardware play nicely and operate efficiently. None of this hardware had firmware or software configurations, and studios required piecing together gear from various sources with few standards on the control side (there were standards on the audio side). Most of the CJOB technical design and implementation during this era was done by a great engineer, Neil East, who sadly died at 41 in a single-engine plane crash near Kenora in January 1984. Thanks for my friend and former CJOB colleague Glen Miller for the picture.